Fashion 2.0: Season of Change. A Forecast of Digital Trends Set to Disrupt the Fashion Industry. 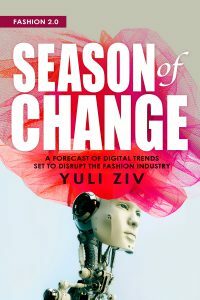 In her controversial second book in the Fashion 2.0 series, Season of Change, serial entrepreneur Yuli Ziv analyzes major technology trends and forecasts their effect on the fashion industry. She questions why everyday objects such as clothes used by the entire human race see so little innovation. Her book, with a foreword by a visionary venture capitalist Lawrence Lenihan of FirstMark Capital, is a wake up call to the outdated fashion industry. A must-read for everyone involved in the business of fashion from designers to company CEOs and marketers, Ziv s bold predictions sure to incite debate address the future of the industry in multiple areas including consumer, branding, retail, product and lifestyle. Her goal is to provoke thought and foster innovation by challenging the status quos from seasonal collections to pricing models; production and manufacturing; traditional advertising; trend forecasting; fashion week and more. She also offers up ideas for fellow entrepreneurs seeking to make their mark on the industry. Ziv highlights trends that brands need to consider in developing a successful strategy to navigate this new environment of constant change including: the rise of group consciousness and crowd sourcing; the shift from search to discovery; the power of suggestion; the monetization of influence; personal style as a commodity; personalization; interaction and engagement; efficiencies; and data as the new retail currency. She takes a critical look at luxury brands, stating that innovation is slowly replacing heritage as the new attribute of luxury for the future. FASHION 2.0: Blogging Your Way to the Front Row. 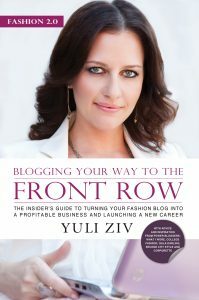 The insider’s guide to turning your fashion blog into a successful business and launching a new career. Full of action driven exercises, helpful resources and inspirational chapters by top fashion bloggers What I Wore, College Fashion, Gala Darling, Second City Style and Corporette, the book is packed with all the advice and motivation you need to take your blogging career to the next level!